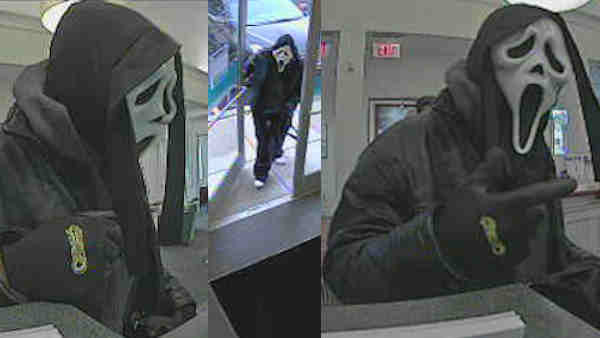 NORWALK, Connecticut (WABC) -- Police are looking for a person who wore a "Scream" mask while robbing a bank in Norwalk. Around 2 p.m. Tuesday, the suspect went into the First County Bank at 660 Main Ave., and using a deep voice, said to a teller, "give me all the money in your drawer." The suspect was wearing a ghost mask similar to the one worn by the killer in the "Scream" movies, a black leather jacket, a black hooded sweatshirt, black gloves with a design, dark pants and white shoes. The suspect is believed to be a white man, according to the Norwalk Police Department. Anyone with information on the case is asked to call (203) 854-3034.